Goodbye Oakland Raiders, Hello… SF Raiders? The Raiders are scheduled to play perhaps their last game ever in Oakland vs. the Broncos on Monday night. Already, Denver local news is sounding the alarm about the dangers that await Orange Crush in the Black Hole. Stories about rough and lawless crowds for Raiders games at the Coliseum are the stuff of legend. Like most legends they tend to be either fictional or largely embellished. There have been incidents in the past, though, and for the final game in Oakland Raiders history, the Coli is likely to be quite lathered up for the occasion. I don’t blame fans if they do, save for violence. To add insult to injury, the Raiders have started talks with the Giants to play the 2019 season at AT&T Park. It would only be a temporary stop as the Raiders await their palace under construction in Vegas. Still, the Raiders playing in SF has to be insulting for at least some Raider fans. Is it possible, though? (A) Whenever any two member clubs, other than the San Francisco 49ers and Oakland Raiders, are located and hold franchises for different cities within 100 miles of each other measured from the exterior corporate limits of the city, then the territorial rights of each of such clubs only extend to and include an area of one-half the distance between such cities. The home club in each city shall have the exclusive right to exhibit professional football games played by teams in the League in its city, and neither the San Francisco nor the Oakland club shall have any right to play professional football in the city of the other without the consent of the other club. In respect to the area included in the home territory of both clubs, but located outside the city limits of both cities, both clubs shall have joint rights of exclusivity, and both of said clubs may play games with other clubs in the League within such area without the consent of the other club also operating in the same home territory or any part thereof. No other two-team market is codified this way. In fact, the only other two-team NFL markets (NY and LA) either have a shared stadium or are building one. So it would appear that the Raiders need express permission from the 49ers to play in SF. That’s despite the fact that the 49ers don’t play their home games within SF city limits. The Bay Area is weird that way. Whether the Raiders play at China Basin, East Oakland, or Timbuktu next year, the lawsuit filed by the City of Oakland against the NFL and the Raiders is likely to continue. To that, I look at it as every pile after a tackle – nobody knows where everyone’s hands have been. 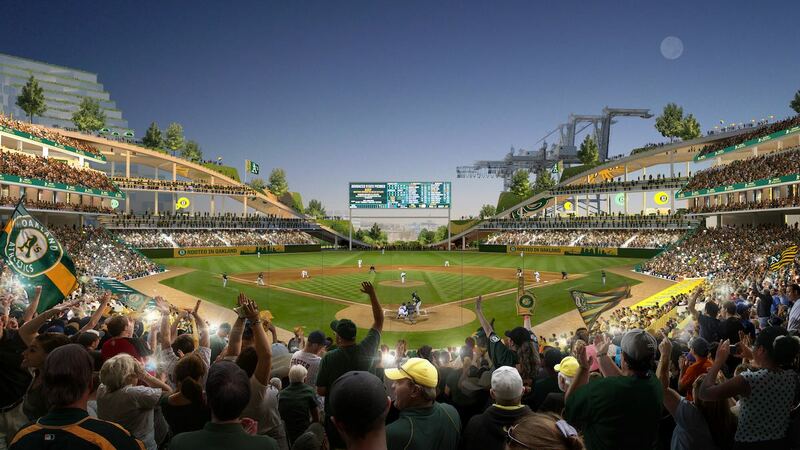 When I spoke to A’s President Dave Kaval yesterday, he admitted that he had some 60 interviews recently about the just unveiled ballpark project. I wanted to talk with him sooner, but my rehab schedule is quite full these days, leaving only Friday afternoon available for me personally. Kaval called me on the dot at 1:30, and after some pleasantries I fired off a bunch of questions. I started off talking about lessons learned from the Peralta, er, debacle. Kaval said that the A’s have spent a year involved in community engagement, including 24 workshops and salons. This plan is “bigger than baseball” to borrow a phrase from the Sacramento Kings. It absolutely is much, much bigger. Check out the rendering above. To the left are I-880 heading towards downtown. Then there are some massive condo or apartment buildings to the west of the ballpark. Howard Terminal and the ballpark are in the middle. Then more new buildings, and finally Jack London Square, which is completely dwarfed by the scale of the new construction. To be fair, that would be the case even if the ballpark was by itself with no ancillary development due to the low-slung nature of the JLS buildings. However, this view really puts that comparison into perspective. 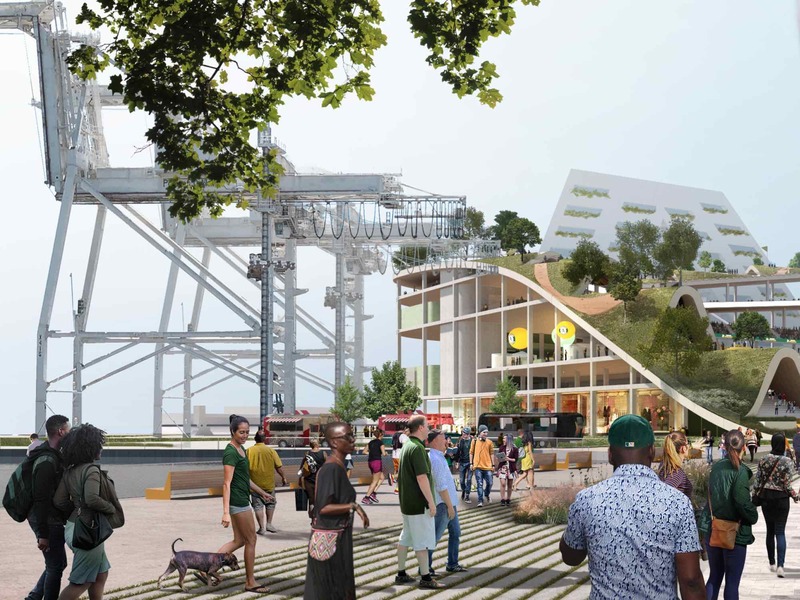 A big key for Oakland citizens’ acceptance of this vision of the future is whether they want a big playground at this location. The view from down low is dynamic, if not breathtaking. That’s partly because unlike most of the retro-modern ballparks built in the recent area, the outfield is semi-closed. The ballpark is oriented so that a line running from home plate to centerfield runs close to true east, or 90 degrees if you’re looking at a compass. The Coliseum’s orientation is 55 degrees, while AT&T Park is 85 degrees. And for those who prefer a splash landing-friendly orientation, Globe Life Park is angled to the southeast at 135 degrees. Always eye-catching are the shipping cranes beyond the right field alley. Which, if Matt Olson had his way, might be reachable via his beautiful left-handed swing. Dead center has the requisite big scoreboard, but where is the batter’s eye? 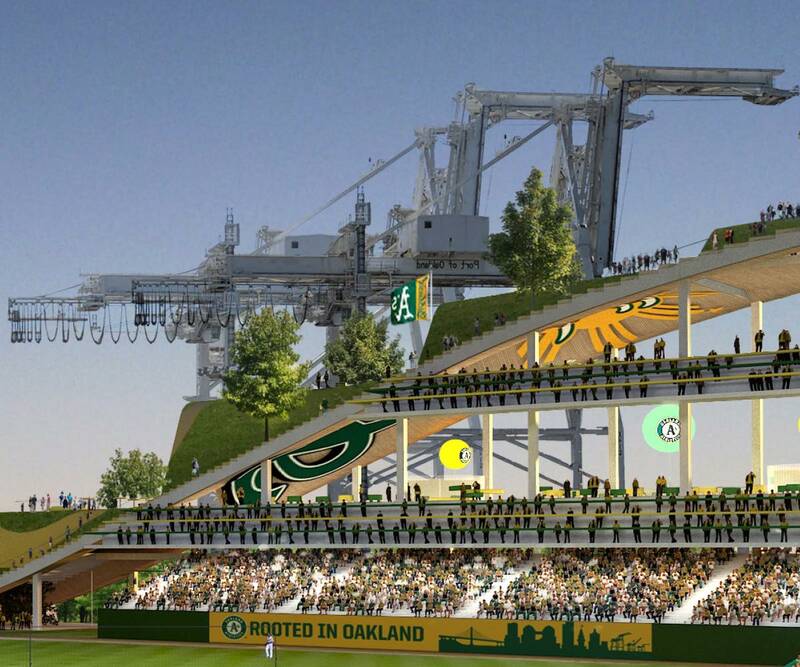 According to Kaval, the A’s intend to put a retractable batter’s eye in place. I asked if it would act like a pull-down projector screen. He said that it would operate more like an airplane hangar door. The tree-lined roof deck slopes down from either foul pole. Kaval confirmed that those slopes will be navigable via walkways. I could make out the paths on the inside facing the field, but not the outer perimeter. The rooftop deck will carry a lot of standing room admissions. How much is to be determined. I suppose if the A’s could get the proper fire and seismic clearances, the rooftop could hold 10,000 on its own. The A’s advertise the ballpark as having a capacity of 34,000 seated and standing, so I imagine there’s room to play around with the mix of seating types and standing areas. Looming in left field is large ziggurat-style building. Incorporated within that structure or adjacent to it is expected to be a reconfigured power “plant,” which may end up becoming a massive “battery” or energy storage for the City. PG&E is working on a deal to make that happen by 2022. Shutting down the production side of the plant would allow more space on the other side of the tracks for parking or a green buffer zone. The ziggurat itself looks to have more condos, which if you haven’t noticed, is shaping up to be a major funding source for the ballpark. The Chronicle’s Peter Hartlaub had the tweet of the week/month/year when he compared the vision to Lord of the Rings. As a baseball fan, Oakland fan and “Lord of the Rings” fan, I’m endorsing the hobbit-friendly design of the #HowardTerminal A’s ballpark. I got a high-res rendering to investigate this further, and frankly, the image above the tweet looks like Hobbiton – replete with hobbits – to me. It makes perfect sense. After all, the Eye of Sauron showed up a few weeks ago across the bay. Kidding aside, the rendering shows that the ballpark will have three seating levels and five different concourse levels including the undulating roof deck. Break out your smartwatches and pedometers, folks, because we’re going on a hike at the ballpark! To Mordor! Triple-decker, you ask? I asked Kaval about this directly. He confirmed that the second and third decks will be fairly small, the upper deck having only nine rows. A level of suites hangs underneath the second deck. At least for now it is. The goal here is for fans to be able to have a great view of the field and the ballpark’s surroundings if they turn around. It’s still an outdoor park so it doesn’t need big windows like a retractable dome stadium would. And like I’ve indicated in the past, the architectural firm, Bjarke Ingels Group, isn’t likely to do a throwback design in terms of form. So open it is. The buildings to the west are meant to help protect against the onshore winds. Kaval mentioned that some wind tunnel testing was completed. That also explains the field orientation and semi-closed ballpark structure, even if there are few exterior walls. The corners of the square will have walls for the normal functions: security, concessions, and circulation. If you’re standing at a random location on any of the concourses, you should have a 360° view. There is that single scoreboard in center and dual ribbon boards around three-quarters of the interior rim. Obviously there’s a lot of space available for other scoreboard panels, fixed signage, player tributes, and other message boards. Some of those items will be governed by economics. Since the Coliseum’s existing scoreboards are only a few years old, I can see them being reused at the new venue. At least there won’t be tarps. On the other hand, there’s isn’t likely to be much homemade signage on display. The place is being called the “jewel box.” It’s not a corner convenience store. Or the Coliseum for that matter. I let Kaval know that in Bay Area history there another venue which tried to be marketed as a jewel box. I’m not going to rehash the history of the arena as this post has already run 1,100 words. Maybe another day. Update 11:34 AM – After posting, I realized I forgot about the lighting design. It’s best viewed using the rendering looking west from beyond the outfield towards home plate. The designers call the roof deck the “eyebrow” of the stadium. A while back I saw some social media threads discussing ways to use existing shipping cranes or even making fake ones to use as light standards. I shook my head when I saw that as I knew that those old lighting conventions are at this point visual affectations. Light standards are a relic of the 20th century. It’s 2018. We can use LED lighting for our sports fields. It’s more power efficient than the old metal halide lamps of yesteryear. LEDs don’t require much time to warm up, are solid state, and are already in use everywhere from scoreboards to replacements for incandescent lamps to smartphones. Folks, we have the technology. Tomorrow we’ll go into the ballpark’s setting on the waterfront, and what that entails. And if you haven’t noticed, the theme of my posts is to start with the ballpark and extend outward in my analysis. Besides monitoring Twitter and reading every article I could find, I made time to talk to A’s President Dave Kaval earlier this afternoon about the Howard Terminal and Coliseum announcement. Unlike the Wolff interview series a few years ago, this was over the phone and won’t be transcribed. Instead I’ll describe what I’ve seen so far and intersperse it with relevant quotes from Kaval. In lieu of any assembled thoughts on the subject, I’ll lay out my plans for the coming days. Expect Part I of the Kaval Call series to come out tomorrow, with the subsequent installments coming in the next few days. I’m still jotting down my thoughts, so if you have any questions drop them in the comments and I’ll try to include my responses in the posts. Yes, there will be some comments about The Shire. Huge thanks to A’s VP of Communications Catherine Aker, who asked me a couple months ago if I would be interested in interviewing Kaval. At the time I declined, telling her to let me know when the A’s were ready to announce something. As a pro would, she got back to me this week. Apparently they’ll present or discuss both Howard Terminal and the Coliseum as potential future sites. 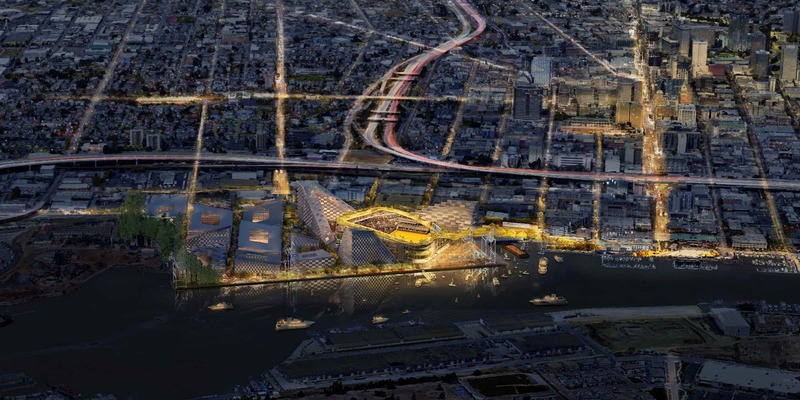 So far I haven’t heard about any plans to use the Coliseum land to help fund Howard Terminal. I won’t be at the open house as I’ll be busy, but the Brothers August (Jeffrey and Kevin) will both be there and plan to report back. Say hi and dream about the future. The A’s also announced that FanFest will be back at Jack London Square on January 26. I wasn’t able to make it last year due to the unfortunate timing of my health scare, but I’m feeling well enough that I might make it up for the day. Plans are in the works.